You see above a stylised map of the battle of Dresden from 1813. I have picked this for no other reason than to illustrate the contents of this post and have no intention of replicating the armies of 1813 - at least not in a figures based format or indeed, anytime soon. For some time now - probably measured at around 15 to 20 years (I kid you not!) - I have been pondering over the concept of what is in effect can best be described a 3d board war game. In my interpretation of a 3d board war game the playing surface is Hexon, the terrain is 3d but the units are good old fashioned wooden blocks. Now I realise this approach is the opposite to games like Battle Cry or Memoir 44 - they have 3d units and 2d terrain tiles - but for somebody like me this has enormous potential. The reasons are many and varied but I suppose the biggest single reason is that using blocks will enable me to indulge in many different flights of historical fancy as the mood takes me but without the attendant drama of acquiring and painting figures - something I have little talent for and even less inclination to undertake. Two things have served to nudge this idea up the batting order - the visual success of Command and Colours Napoleonic blocks used with 3d terrain and the relative ease of setting up unit labels on an ordinary home PC for use with such a system. I should point out at this stage I am not thinking about replicating units in the fashion used by C and C Napoleonics - using images of actual troops - rather I an opting to use standard military map symbols to produce labels on my PC that can be easily printed as often and in the quantity and size needed. At this stage I am very much at the experimenting stage but if this comes off the potential is enormous. I am planning on using blocks with a 3" frontage and varying depths; together with some 1 1/2" squares for things like command or small units, artillery batteries etc. By using wood with a depth of around 1cm I will have enough space on the edge of the block to put unit identifiers, commander's names etc. By setting up a template and using Microsoft Paint or similar to provide the colour I will be able to produce units labels in a huge variety of shades for differing armies with the bonus that certain colours would be usable for numerous era - e.g. blue for ACW, Napoleonic, AWI etc. I will post on this further in due course but at this stage the first draft I have cobbled together certainly looks the part. I realise that this will probably seem like heresy to most figure gamers but I take the view that if using blocks was good enough for the pioneering Kriegspiel wargamers then who am I to argue against it! It has been a busy week on the work front and so my somewhat insane schedule of rule writing, scratch building, converting and painting has been very muted as a result. The one thing I have been able to catch up on though has been to remedy a number of glaring omissions from my library. The Conway's and the Jane's acquisitions have already been mentioned in dispatches so now it is the turn of some genuine, honest to goodness wargames books to take centre stage. There is also a version of F.T. Jane's Naval Wargame rules available which will be acquired in fairly short order (I missed seeing this when ordering the others!) thus completing the collection. I cannot begin to sat how pleased and inspired I am by (at last) owning these titles - I am quite sure that a lot of new ideas and projects etc will result - as previously I had only ever seen these as as library books or quite expensive second hand versions (not the Pratt title though although I have used the rules often in the past). There are rules, ideas for rules, complete sets of rules and how the rules were formulated; together with an historical coverage from Ancient Greece and Rome up to the end of WW2. Also, tips for scratch building and loads of photos and diagrams etc. In short, pretty much everything you would be likely to need in order to get your feet wet in naval wargaming (dreadful choice of comment I know!). That little lot should keep me busy for a while and no mistake! I also acquired, purely for nostalgic reasons, a copy of Charge! by Messrs. Young and Lawford. I can safely say that this has to be one of the most entertaining and fun books on our hobby ever written, bar none. John Curry and his project is truly deserving of the support of the wargaming fraternity so it is well worth taking a look at his list and, better still, ordering something as this will enable him to continue to keep the thing afloat and to make further titles available in the future. James Bond would have been impressed! I kid you you not - and it is up for auction at Bonhams on August 19th! From the net: "With its swivelling searchlights and arsenal of animal-killing weaponry, this isn't just any old Rolls Royce. It's a 1925 Torpedo Tourer or 'Tiger Car' built for Umed Singh II, a maharajah who was rather fond of hunting the big cats. Before anyone gets excited, the rather grand vehicle does come with a price tag that warrants a deep sniff of the smelling salts. Next month it will be one of six pre-war Rolls-Royce and Bentley cars up for grabs when Bonhams holds its annual auction on the Monterey Peninsula in California. It's expected to fetch between $750,000 to a cool $1million. In its hey day the car had all the latest tools for the hunt. It boasted a large-calibre gun for seeing off charging game; a number of bird guns, rifles and shotguns mounted in the cabin; and, at the rear, a trailer towing a Bira .450-caliber hand-cranked machine gun - the primary weapon for hunting Bengal tigers. The machine gun attachment still exists and is part of the auction. If that wasn't enough the maharajah also had a Lantaka cannon attached to the rear bumper, should he fancy a spot of elephant hunting before tea time. The top speed of similar models is around 88mph but the gearing on the Tourer was built for stealth plodding in the jungle rather than cruising down the streets. It's powered by its original 8-litre, 6-cylinder engine. This would have been custom built to suit the owner's preferences. 'There was no going to the dealership and just picking out a Phantom in a colour you liked,' David Swig, a specialist with Bonhams auction house, told the New York Times. 'They were built to order. Many maharajahs built cars like this.' Worryingly the interior of the car boasts a Chubb safe for holding contingency money for any family members of hunting assistants killed in the bush, according to Bonhams literature. It also has seats upholstered in crocodile hide just in case riders were in any doubt what the car's purpose was for. There is no record of a torpedo being attached but the body work could certainly have supported one. Given the amount of other ballistic material it had sticking out of every nook and cranny, it is feasible. The Tourer has been owned by collectors in both England and the U.S.. It has undergone two restorations in the 1960s and 1980s. The Bonhams auction is on August 19." Hurrah!! At long last I have been able to source a copy of this naval bible for my collection! I have been after this for what seems like an age and managed to land one via Ebay from a seller that lives a mere ten minutes from my house and so I was able to collect in person - just as well as the postage would have fairly lumpy for such a hefty tome. The book is in very good condition with a small nick on the dust jacket being the only obvious wear. I have also sourced a copy of an 05/06 Jane's - the David and Charles reprint - which will complement the Conway's title handsomely. The two titles have cost £20 and £10 respectively which is pretty reasonable in my estimation. I shall now look to acquire the 1906 - 1921 and the 1922 - 1946 Conway's titles and a select couple of editions of Jane's as well so the naval reference library will then be in pretty good shape. I have been giving a lot of thought about ship models and the varying sizes available and how to use them. I am thinking about 20th century naval warfare in particular and so am unable to comment about other periods but I guess the same observations would apply up to a point. What prompted this consideration was reading the WW1 rules from Paul Hague's book - Sea Battles in Miniature in which he outlines the game scale he uses. In a nutshell he is using 1/3000th scale models based on 3" bases. The scale is 40" representing 20,000 yards - which is coincidentally the maximum range used in the Avalon Hill game Jutland (the distance represented by the range finder used for measuring ranges) and also in John Hammond's Naval Rules published by Skytrex. The 3" base represents some 1,500 yards and a single 1/3,000th model represents two such ships. Fletcher Pratt in his games used models larger than 1/1200th and ranges measured in feet which was still not accurate in terms of model/scale representation. In game terms then and in order to be consistent with the game scale a 600 ft dreadnought using Paul Hague's scale would come out at a little over half an inch long. This is very small and even using 1/6000th scale models the result is over scale. This presents something of a dilemma as the larger the models used the more the scale becomes distorted. I should point out that I am thinking about the naval game on a standard dining table - not on a floor or in a hall or even on a couple of tables joined together. Now most naval gamers accept this apparent distortion as a necessary evil - if it is even considered at all - and spend a lot and time, effort and money amassing the fleets and rules for use in their games. I am no exception to this as my various collections prove but I do wonder if this is the only way to approach a naval wargame - by using models, or at least models in the traditional fashion. If models are the preferred option (and if using a scale similar to that suggested by Paul Hague), and at the risk of stating the blindingly obvious, then clearly those that are currently available are too large. The problem then becomes what can use use to represent a dreadnought battleship a half an inch in length - thereby ensuring the model/ground scale are more or less consistent? Clearly conventional models are of little use at this level and in fact one is almost is straying into board game counters territory. A typical board game counter of a half inch square is just about right but hardly aesthetically pleasing although some of the counters available in various board games are quite the work of art in terms of detail etc (I am thinking of those from the Great War at Sea series of games) they are still invariably too large. My solution to this conundrum is quite simple and whilst it will work for me may have die hard model gamers staring askance at the screen as a result of the heresy I am about to reveal! Using Paul Hague's scale with the 3" base it becomes very simple. The represents the sea are occupied by a pair of dreadnoughts allowing roughly 750 yards each. This means that each 750 yards (2,250 feet) includes 600 ft or thereabouts of battleship (which is in fact less than the half mentioned earlier - the maths are a little suspect methinks!). Rounding this up to 750 feet (scale distortion at work already!) it gives you half and inch. It would be very easy to produce a ship shaped and grey painted marker of this size - obviously with no surface detail - to affix to the base of the appropriate size and to then duly festoon the same with waves, wakes, flags and the ship's name - thereby maintaining the allusion of using a model. The ship damage chart though will provide the visual detail that the model does not. The damage boxes could be imposed over a drawing of the ship is required or even just having the gunnery boxes in a stylised layout of the actual ship itself will serve to 'illustrate' the vessel in question. The advantages of such an approach are many. The 'models' will cost next to nothing to make and the key thing is that they will still need to be made so as to satisfy the modelling part of the process. Storage would be incredibly simple and the sheer quantity of fleets that could be constructed in such a fashion is enormous. I personally would 'tweak' Paul Hague's basing idea slightly to have ships cruiser sized and larger on bases 1 1/2" square and for destroyers 3/4" by 1 1/2" so these bases could be combined in multiples for the standard 3" by 1 1/2" version. Obviously such a method would be ideal for large actions and would have the result of the average dining table appearing to be a better representation of the action rather than by using conventional models. An added bonus would be that identifying enemy ships at typical gunnery ranges becomes a real problem although having a ship name plastered on the base, even when viewed upside down, would be a bit of a clue! The picture above is of the second of the conversions undertaken for the 1914 Turkish fleet using Minifigs ships. She is the Reshadieh or HMS Erin as she became after having been seized by the Royal Navy. I opted for her rather than HMS Agincourt simply because she was a very easy conversion to do whereas the Agincourt would have been rather more ambitious! Reshadieh - the white deck house will be a lot less obvious once painted! She was a good ship although quite short ranged by Royal Navy standards although as she was only used in the North Sea this was not so much of a handicap. It does mean though that both her and the Yavuz will need to consider frequent coaling stops whilst out raiding allied supply lines. As mentioned the model was very straightforward to make and merely involved removing the third funnel and clearing the top of the rear deck house from one of the Lion class models I have and simply adding a turret. Some plastic rod was added to the rear of the new turret for some detailing. Strictly speaking 'Q' turret should be a deck higher than on the Lion but this would have involved some fairly drastic surgery and so I left it as is. I have changed my mind about converting another of the Lions so Reshadieh will be the only one. The two ships will form a powerful force that the Royal Navy will have to treat with respect and that will need to be urgently dealt with as soon as they are able to. Trees a Jolly Good Fellow! Not quite a forest but it is a start! At my daughters school - which is a mere 150 yards from my front door - there is a monthly Toy and Train fare. I have lived in my house for a shade over six years and have never been to this fare at all - which is a real shame as it is, by all accounts, a veritable treasure house of goodies. The picture above is the result of a visit to the most recent of these fairs by my good friend, Chris Hardman. The trees are of course, by Merit and are the ones that I have been after for some time. they came in their original boxes and there are six fir trees and three alder. The sets are complete but the trunk sections are unusable as they have been afflicted by the perennial problem of old polythene - becoming brittle. In fact they snapped very readily but fortunately I have a supply of plastic tree bases from K and M trees acquired some time ago that will suffice. I reckon I will need another box of each and one of poplar trees and that will be more than enough for my needs. The best piece of news in connection with this acquisition though was the cost - £1 a box. My thanks once again to Chris for spotting and acquiring these for me and I have made a mental note that when the next fair is on - 28th August - I shall certainly have to pay it a visit! Following on from my post of yesterday I have given some further thought to how best to utilise the models I have available from the Minifigs ships range to represent the combatants. I have made a number of historical assumptions concerning the political set up, the ships in use and the strategic situation. This probably seems a little on the extreme side but I find it helps to round out the back story and add the all important period 'flavour'. The Turkish fleet as it stands will have the Sultan Selim and the Midilli (Goeben and Breslau) but will also add the Reshadieh - the ship that became HMS Erin. Three pre-dreadnoughts, a pair of protected cruisers and around 10 or so assorted destroyers will complete the force. Reshadieh will be a conversion of one of the Lion class I own and will look more like an Orion/KGV class when finished but will be close enough for my purposes. I will be sacrificing one of the Lions in order to do this and so will also make a further copy for use with the RN as one of the aforementioned Orion/KGV types. As befits the world's leading naval power the RN will be considerably larger. She will have a battle cruiser squadron of a pair of Indefatigables and the Lion (as flagship), a battle squadron of three Bellerorophons with an Orion/KGV as fleet flagship, both of the Weymouths and three each of the Drakes and Devonshires. Around 16 to 18 destroyers will complete the force. The Greek navy serving as allies will furnish a couple of cruisers and half a dozen destroyers. Observant readers will have noticed that the numbers do not quite tally up with the list of yesterday and that some models are unaccounted for. There are plans afoot for these but I would be less than truthful if I said that I know what they were! I am short of pre-dreadnoughts though and so will be trawling the net for anybody having a supply of these models that is looking to offload any. As ever, many of the models are very basic representations of their historical counterparts and a number of liberties have and will be taken over what is being used as what and by whom. Still, one should never allow historical accuracy to get in the way of a good game! I have access to a really good map of the Mediterranean for WW1 contained the board game 'The Great War at Sea: The Mediterranean' which is marked in offset squares rather than hexes although I would like to try and find a copy of the map used in the SPI game 'The Flight of the Goeben'. Now in order to clarify a fairly significant point I have to say that what you are about to read is not a new project - it is merely a subtle variation of an existing idea! Also three submarines - 1 x No.25 and 2 of No.26. As you can see this is a pretty good selection and I would really like to add to it if I can. This has left me though with a small dilemma, one of which up until now I unsure how to resolve - what should I do with them? This answer came, as usual, in a round about sort of way - as is the norm for this kind of thing, at least in my case anyway. The Airfix 'Sink the Bismarck! set mentioned yesterday fuelled all kinds of happy memories of the celebrated naval campaign ran by Eric Knowles back in the early 80s - more specifically the great naval arms race as the participants scrambled to build, convert and acquire warships from all manner of sources and with the timely releases of the Airfix models providing much in the way of raw material. As did the Minifigs ships that were donated to the cause by Bob Cordery (again - the quantity of these models he possessed must have been huge!). I fully intend in raiding Airfix once again in due course for this set but the subject in hand is the Minifigs ships I own and what I intend to do with them. I am going to be using most of them as they are but a number will face some conversion - the first of which will reveal exactly where my idea is leading. Take one Minifigs 'I' class battle cruiser, remove the rear funnel, reduce the rear deck house, add a further turret, remove the two centre turrets and redeploy to the wings, drastically reduce the height of the remaining funnels, cut down the forward bridge almost to nothing, add a pair of plastic wings to the bridge, add a couple of crane assemblies next to the centre funnel and voila! - Instant Moltke class battle cruiser, or in this case, the Goeben. ....And the after! As the Meerkat would say...."Simples!" The plan is very simple. I am going to use a few of the models for a representative Turkish navy whilst the main bulk will be used for the RN - but specifically for the Med as all the good stuff was kept in home waters to face off against the High Seas Fleet. The Med had to make do with whatever could be spared aside from the occasional cycling through of early dreadnoughts or battle cruisers (yes I know the QE calibrated her guns there but that was a fairly unique circumstance). I am assuming that the French are occupied in the Western basin of the Med so I don't really have to worry about them too much. The idea I have is for an almost Bismarck type operation set in the Med with the Goeben and the Breslau taking the place of the 1941 protagonists. I need to spend some time organising this but I have all the models and the rules are ready so it should be pretty quick to set up. As for the Goeben, well she is pretty crude but a reasonable enough representation - I am aware of most of her deficiencies as a scale model - simply because I have a lot of pictures of her in my collection. She will do. A Most Welcome Return - My only problem is how many sets to order! Oh boy, oh boy, oh boy! I have had some truly epic games using Fletcher Pratt's rules on a dining table with fleets made up of models converted from any one of these kits for use in a WW1 setting. I am referring to the South East Asia WW1 naval campaign that was set up and run by Eric Knowles just after the conclusion of Madasahatta - which I was also fortunate to have taken part in - albeit at the very end of the campaign. Sadly, to the best of my knowledge there are no photos left of the campaign (I am sure some were taken though), nor were any of the actions documented but the stars of the show were the models - and what an eclectic (read motley) bunch they were! At the top end we had some stunning examples of Neptune, Navis and Mercator (the games were in the only proper scale for a naval wargame - 1/1200th) models, a hole heap of scratch builds, some Minifigs ships (donated by Bob Cordery), assorted 'cheap' 1/1200th models - destroyers and such like - and the final source being the then new range of Airfix 1/1200th waterline models. These were hoovered up in quantity and were used as the basis for a whole host of ships - most of which were far removed from the original intention. The upturned hulls of the tribal class destroyer after some TLC became the two Turkish cruisers Hamidiye and Mecidiye and I used various parts from the Bismarck kit to build a Goeben. The campaign was great fun but did not make it much past January 1915 as the central powers had been thoroughly hammered into the world's largest salvage operation and had, in truth, run out of ships. To this day I am unsure if revealing the exact visibility distance was an intentional slip on Eric's part or not - the central powers had been on the end of an almost unbroken chain of defeats and so perhaps he felt sorry for us! I really should have known better! My plans for the Sunday play test of the 'Jutlandised' naval war game rules failed (once again) to materialise in the face of some family stuff which took longer to tackle than first envisaged. This was unexpected (and quite tiring) but was quite rewarding in its own way so certainly not all bad. I was able though, with the time that was available, to complete the draft revisions to the rules and to clear my thoughts of a couple of sticking points that were troubling me in connection with gunnery. This is now clarified to my satisfaction and so I am all set to run the test at the first opportunity. Having opted to use ship specifications straight out of the book' rather than converting historical data into factors for weaponry has been a major time saver - the only conversion now required is that of speed into hexes as all guns are used as they are e.g. an undamaged QE class battleship will fire with 8 x 15" on a broadside rather than an assigned factor. This will sound much more realistic during the heat of battle and so has far more historical resonance! A small point to be sure but it does also mean that knocking up ship damage record cards will be a lot easier (and faster). Whilst completing the revisions to the draft I pondered further on the question of the play test and when I would be able to fit it in as normally even a small action requires a certain amount of setting up to run - and this usually not something I like to tackle during the week due to time constraints. The answer came in one of those occasional flashes of inspiration I have. Many years ago, back in the early 1980's, I used to take part in a number of role playing games. As part of this phase I acquired a number of pads of hexed paper - used for mapping locations where the action was being undertaken and such like (I even ran a few such games and it was quite good fun at the time). I still have these pads and the hexes are in two sizes. The first used standard board game sized hexes of roughly half an inch across whilst the second used one inch across the hex flat sides. Both pads are A4 in size. I had planned to use these pads for designing scenarios and for plotting moves (a la Jutland) or even for campaigns but I suddenly thought - why not use them for testing the rules out on rather than setting up the table with Hexon tiles and models? The larger of two pads has an area of 7 by 11 hexes - a little smaller than my preferred 8 by 12 but absolutely fine otherwise. Obviously I have no ship models of that size but for testing purposes that does not matter as I have plenty of material that could easily be used for ship counters. In this case I have opted for using small wooden blocks with the ship name or some other identifier stuck on the top via a sticky label. Counters from any one of a number of board games could also be used - they do not have to be anything fancy; merely identifiable as whatever ships are being used for the test. In the interests of saving time I plan to take this set up to work to use it during my lunch hour in a quiet corner of a coffee shop or a pub somewhere in the city. It will not take up a huge amount of space and I can certainly live with the odd looks I may receive when rolling a dice on the table and moving pieces of card/blocks of wood or whatever else I opt to use for the ships! The irony is of course the fact that this is truly a 'Portable Naval Wargame', albeit merely the test bed for the rules! 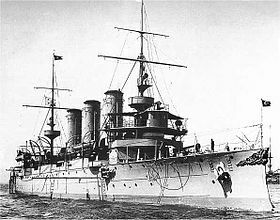 SMS Seydlitz - A favourite warship of mine! The rules are ready for the test I am running tomorrow and as usual, I am very excited at the prospect. The opposing forces will be the Greeks and the Turks and all I have to do now is to finalise the format of the damage cards. In advance of the test I thought it would be a good idea to explain how some of the rules choices were arrived at and why I have taken the approach I have. Movement - This was pretty straightforward and all I have done is to take the actual speed of the individual ship in question and to convert this into hexes. I wanted a maximum speed of around 6 hexes (being around the 36 knot mark) and initially this caused a few problems because of the historical closeness in speeds between ships. It felt unrealistic having generic speeds for ship types and so I opted for a variant of the technique employed by Barry Carter in his book Naval Wargames (ISBN 0 7153 6812 5) of having 'long' and 'short' moves. For example, a ship rated as 2/3 can move 2 hexes on a short move and 3 on a long. My variation on that is to allow a ship rated as such as being able to move at the higher rate on any three game turns within the 6 turns making up a map move (1 game turn equals 10 minutes). This allows for an element of uncertainty over movement intentions on the tabletop. Turning is in increments of sixty degrees and costs a movement point to execute. Speed loss from hard turns could be very dramatic and so including this aspect of seamanship was essential. I have increased the number of ships that can operate in a single hex to two for cruisers and four for destroyers - primarily for use with large actions. Defence - Ships in the original game had a protection or flotation factor based on what looks like the maximum thickness of the belt armour of the ship under consideration. Ships could only be sunk by losing all their flotation value. In the game gunnery first had to destroy the target ships gun factors and then the excess hits went onto the flotation value. Initially I thought this was a little on the abstract side but after having carried out some research on the subject of the effects of naval gunfire on a ship I can see why this approach was used in the original game design. Warships are ordinarily very difficult to sink by gunfire alone - unless a lucky magazine hit occurred or there was an enormous disparity between the weight and effect of the incoming shells and the size and protection of the target ship. I decided therefore, to stick with this approach and so the protection/flotation/defence factor of the ship is equal to the maximum thickness of its belt armour. The original game assumed that a ship would have to have all its gunnery factors destroyed before they could be used on the flotation value. Given that a ship could be hit anywhere - including on or below the waterline - I am allowing the owning player to assign any hits received in any way he wishes. This will mean that hits will be well spread about which is historically accurate. In the game the above approach was used for ships from armoured cruiser size and upwards. As I wanted to add in protected and light cruisers as well as destroyers I needed to consider an alternative method for assigning the defence factor to the ship. For the two cruiser types I opted to use the maximum deck amour whilst for the unarmoured destroyers I opted for defence factors based on tonnage. Gunnery - In the original game firing is carried out by the simple but effective method of counting the number of factors available, checking the range, looking up the appropriate column on the gunnery table and rolling a d6. The maximum range in the game for gunfire was deemed to be 20,000 yards. Guns are rated by ship type so we have BB (battleships), BC (battle cruisers), B (pre dreadnought battleships), CA (armoured cruisers) and 'light ships' - a generic heading for protected and light cruisers and destroyers. Whilst these headings were fine for the original game they were too generic for what I wanted to achieve. I would be adding a lot of additional ship types that would not be best served by his approach and so I needed to 'unpick' the generic nature of the firing types and replace this with something with much greater coverage. I managed to 'crack' the method used to calculate the number of gun factors which is based around an 11 or 12" gun being worth one gunnery box. This means that a ship with a broadside of eight such weapons will have eight gunnery factors. Guns of 13 to 14" are worth 1.25 whilst 15" weapons are worth 1.50 so a QE class battleship would have a broadside of 12 being 8 x 1.5. I stepped this back from 1 for guns smaller than 10" which would allow for calibres from 1" to be assigned the appropriate factors. A good example would be the 6 x 6" secondary battery on the aforementioned QE. Guns rated at 5 to 6" are worth 0.5 each so the secondary factor of the QE would be equal to a gunnery value of 3. The original game did not factor in secondary weapons at all other than to double all hits scored from a BB, BC, B or a CA at ranges between 3,000 and 10,000 yards and to triple hits scored below 3,000 yards. What I am considering doing is rather than having artificial gunnery factors is to have the actual number of barrels firing and to merely apply column shifts when firing depending on the calibre of the firing weapon. This would have the advantage of meaning that creating a ship card would be simply a case of converting the details of the ship from whatever reference is being used into gunnery boxes rather than having to calculate anything. What of armour penetration at a given range? What about increased rates of fire for smaller weapons etc? These are abstractly built into the combat table/gunnery factor dynamic in that bigger guns have more factors which means more hits. Lighter guns cause the same amount of damage which could be seen to represent higher rates of fire. Ships also now have more hit boxes to mark off so longer range fire will take longer to produce a result. Interestingly the results at ranges below 10,000 yards having separated out the secondary gunnery factors but by dropping the doubling and trebling from the original rules are fairly similar. Torpedo attacks have been left as they are in the rules - all I have needed to do is to assign the appropriate factor to individual ships. I have also given them a range of 3 hexes - 7,500 yards as opposed to the 6,000 of the original rules. So that is the extent of my modifications/additions to the original rules for the Avalon Hill game Jutland. I think it must be a tribute to the soundness of James Dunnigan's original design that what I have so far attempted has been very straightforward to accommodate. Of course all of this seems fine in theory but of course the real test of how successful (or not!) the adaptation is will be when I test them tomorrow and that will be the subject of my next post. The 'Jutlandisation' of my 1890 to 1920 naval rules is more or less complete and the first play-test will take place over the weekend. The process of expanding the existing Tactical rules for the Avalon Hill game has been pretty straightforward and I like to think this is due to the basic robustness of James Dunnigan's original design from way back in the 1960's. In fact, all I have had to do is to 'hex' the rules and to add in the use of secondary (or even more) batteries of guns and split out the Light Ships category into individual ships for light cruisers and destroyers. Guns types have been classified as per F.T. Jane's system of rating which has in turn determined the ranges I have used. Within the board game ranges have been rather generically lumped together by ship type which is fine for the Jutland scenario itself, less so when you start using more varied fleets - especially with some of the older ships in use. I will not be using Jutland style turret layouts - the damage charts from the game use a top down view of the turret layout for main gun hit boxes - but will split gunnery factors between port and starboard as required. I have not designed a ship record chart for use with the rules as such but will experiment with a few before the test - the main thing is that the data to do so will be in a easy format to use. Combat mechanics have been left as per the original game rules aside from the changes in ranges mentioned earlier and the incorporation of the 'hex factor'. As usual (and especially after the last fiasco!) I will complete an after action report and with the obligatory photos for the blog once the smoke has subsided. The accompanying ship specification charts have (at last) settled on the format I shall be using and these will incorporate not only the game stats but also the historical data from which these have been derived. I got home from work last night absolutely exhausted. It wasn't even a particularly grueling day; nor even a late finish - I was just worn out. SWMBO was out for the evening so I had the lounge to myself (a rare and treasured event - especially with my own choice of background music!) and knowing that painting would not be a good idea I decided to spend the evening sorting through my various electronic files relating to the current naval rules set. I had three versions of the ship specifications on file, together with a couple of versions of the rules themselves and so I spent a happy couple of hours with my netbook checking, chopping and changing the content and also managing to hook up the aforementioned device to my wireless printer. The end result of all this is that whilst the files are now much tidier I am left with the task of compiling the ship specifications in line with the Jutland-esque rule set I am currently working on. This is not a major undertaking as such - I already have much of the detail usable 'as is' - but having done this exercise on numerous occasions it is beginning to be just a little on the wearing side! I was able to finish the last of the ACW ship collection non-painting tasks though so the evening was relatively well spent in spite feeling like the proverbial limp dishrag. Incidentally, the music of choice was a selection of Mozart diluted with the soundtrack to Lawrence of Arabia which I can heartily recommend. Bilbo Baggins was little prepared for the hallucinatory effects of 'Old Silverleaf'...."Like wow preciousss...."
I have decided to in effect expand and convert the tactical rules from the Avalon Hill game Jutland into the fast play set of naval war game rules I have been striving towards. It sounds like a big deal but is in reality quite a subtle shift from what I have already been attempting. The rules themselves are virtually the same as in the original board game. All I have done for my own purposes is to 'hex' the movement and ranges and to greatly expand the coverage of ships represented. Secondary batteries are now included and 'light ships' (in the game these are light cruisers and destroyers and they handled in a grouped fashion) have been assigned combat factors based on the type and so are no longer 'lost in the crowd'. The rules are pretty much finished and are a fusion of what I was attempting in the Portable Naval Wargame and its predecessors - the Morschauser based set and the DBSA variant. The only thing I will need to do is to tweak a few of the ship specs (not with wholesale changes I am happy to say!). As an aside from this part of the project I am going to press ahead with a long held idea about creating an electronic database of ship types detailing all the major data needed - weight, armour speed and weaponry; together with launching dates and names of the ships in the class -in a series of spreadsheets. This will be a huge time saver although no substitute for browsing through a copy of Conways or Janes! In the meantime the swampy bayous have not been neglected and so yesterday evening saw a few small tasks 'squared away' prior to the resumption of the paint fest. "No more of that Brandy wine thank you...."
'I cannot tell a lie' George Washing to is alleged to have said concerning the chopping down of a cherry tree. No cherry trees in my case although I have probably been guilty of removing vast acres of rain forest in the pursuit of the Naval Wargame over recent days . Only two lines I know but as they are the cornerstone of any set of naval rules from 1890 to 1945 it is a pretty big deal if they are not working as expected! An idea I had been mulling over was to create a set of tactical rules based on an expanded version of those included in the Avalon Hill game Jutland. Initially I intended to incorporate a few ideas from this set into the version I was currently drafting. I then considered producing a separate set based solely on the Jutland rules. As the situation now stands the Naval Wargame is at a crossroads. My gut feeling is that I should be looking to incorporate Jutland mechanics where I am able BUT with a more rational approach to ship specifications. I am satisfied that the ship specs I have created are fine as they are BUT (and I realise that is two big BUTS in the same paragraph!) they are not exactly in tune with the methodology used to create the Jutland ship specs. The main differences are between the two sets concerns a ship's protection and main gunnery factor and so are pretty significant. My ship specification figures are slightly less than in the Jutland game e.g. a Jutland QE class battleship has a protection of 10 and a gunnery of 12, in my rules the figures are 9 and 10 respectively. Use the specs as they are and the Jutland firing table - assuming less gunnery factors and less protection will even themselves out. Rework the ship specs up to Jutland standard to ensure a direct relationship between the firing tables and the gunnery values. Of the two my heart says the former whilst my head the latter. I have 'cracked' how the Jutland ship specs were arrived at and ironically, the system employed is a slightly simpler version of how I created the numbers for an earlier set of rules I experimented with. Tweaking the ship specification in this fashion would not be too onerous but it will take time to do. Seriously though, I believe that the Jutland rules have the partial answer to the game complexity I am hoping to achieve with the naval wargame. However, they are insufficient as they stand and so unsuitable to use straight off the bat so to speak. The question is how to expand these into something a little more expansive and so that it what I hope to be able to create. In advance of my play test tomorrow of the revised Naval Wargame rules I have been giving some thought to the scale of action I want to run, as well as the choice of combatants. Initially I wanted to use the Russians and the Turks by virtue of being able to include some dreadnoughts on either side but I have decided against this and will instead head for the Aegean Sea which of course means the Greeks. The scenario I have in mind is a 'what if?' but is based on an actual plan the Turks devised to hopefully isolate and destroy the armoured cruiser Georgios Averoff. The plan was very simple and involved the Turkish cruiser Hamidiye being offered as bait by cruising around the Greek coastline and making a nuisance of itself by bombarding places and generally causing inshore mayhem. Lurking over the horizon would be the might (?) of the Turkish navy which would spring the trap should the Averoff venture out to tackle the offending Turk. Historically the Turks tried this but the Greeks refused to be taken in - despite the public outcry at the depredations of the Turkish cruiser. The Hamidiye became something of a celebrity as a result of its daring escapades and this formed the sole highlight of an otherwise miserable Balkan War for the Turkish navy. By sheer coincidence (and some further manipulation of history) the Turkish line of retreat for their heroic cruiser runs parallel to the Greek battleship patrol line and so, quite by chance (and to make for an interesting game! ), what began as a small affair of outposts has suddenly escalated into an action of major importance. HUZZAH!!!! The ship lists are finished, the next draft of the rules are ready to play test, God is in his heaven and all's well with the world! I will be giving the rules a test over the weekend (with the usual after action report and pictures etc) and assuming all is well will upload the end result into (probably) Google Docs or something similar so if anybody wants to have a bash with them they are more than welcome. Starting Monday - the resumption of the ACW paint fest, 32 models in what will be 21 days. I realise that seems a fairly dramatic headline but the explanation is really quite simple. Whilst the rules are simple in execution and I believe true to the intent of the Portable Wargame I cannot see how it can continue to be described as such. The playing is too large - even when using 1/3000th scale models - and I think the only way to truly describe this as a portable game would be to use hexes half the size of the Hexon version (2" across the flat sides) in conjunction with smaller ship models. I am thinking 1/6000th models and Heroscape tiles as being the ideal size in this case. Since I own none of the former and only 21 of the latter (you would need 64 tiles at a minimum) it seems fairly pointless describing the rules as something they are not going to be - at least in my gaming universe! Having got that point of pedantic clarification off my chest the progress on the ship specification lists has been steady if unspectacular. At the time of writing I have the USA to finish and the Greeks and Turks to review and then they are complete. The South American and Scandinavian navies will have to wait - as will Spain simply because the process has taken longer than I expected it to. As this task is so close to completion (at least until the next round of play testing) the ACW ship painting has been delayed by a few days although I plan to be resuming this by the weekend at the latest. Of the 32 remaining models 16 are roughly halfway complete so as long as they are finished by the end of next week the final 16 will have the remainder of July to be worked on. Independence Day - and not an Alien or Will Smith in sight! It is July 4th, so to our American cousins - have a great Independence Day! An old photo - but you get the idea! It has been a busy weekend as yesterday saw SWMBO and I tackling our own annual boot sale - in which are selling assorted unwanted household odds and ends. Much as I enjoy going to boot sales I find actually doing one to be a major headache - only having a Honda Civic probably does not help although you would surprised how much stuff can be crammed into one with a little ingenuity! We chose to go to the local 'lazybones' boot sale and so did not have to make one of the 4am starts for the more usual ones. After some four hours we had made around £110 - mostly from old clothes - and so overall it was successful although we still managed to return home with a car crammed full. SWMBO felt sure we had made a major dent in the sale stock but I was unconvinced by this! Mercifully a trip to one of the local charity shops will reduce the supply further. As is usual when we are running a sale we are able to have a wander around and browse the other stalls and so I was delighted to have been able to pick another copy of the board game Risk - the version with the generic 18th century figures - for £1. It was missing a couple of d6 but this hardly mattered as I only wanted the figures in any event. The other find was a mixed bag of wooden 'Town in a Bag' buildings (probably about three quarters of a set) and what appeared to be a set of the Oxfam African Village. This contains some 14 wooden huts and a lot of 'fencing' plus the usual animals etc (all of which have been saved in a bag for my grandson for when he is no longer putting everything in his mouth!). This also cost the princely sum of a £1. I now own a fairly large selection of the 'Town in a Bag' style wooden buildings and am looking forward to using hem at some point although at the present time the ceramic Greek/Balkan buildings will probably see action first. We arrived home at around 2:30 yesterday afternoon and as the weather was really nice we decided on a barbecue for our Sunday main meal and so it early evening before I eventually flopped, exhausted on the sofa. I am half way through Italy and will need to recheck Greece, Turkey and Black Sea Russia and so will be left with USA, Japan and the Baltic Russians. I was not able to tackle the play test that I wanted to do and will attempt this next weekend instead. Tomorrow evening will see the resumption of the ACW ship painting and I am committed to completing the remaining 32 models by the end of July so watch this space! Some time ago I acquired a copy of a disc of Avalon Hill Naval games included in which was a complete set of the components for the classic WW1 game Jutland. I use the word classic intentionally because the game is quite simply one of the most entertaining games of naval warfare ever designed. For those of you that have not enjoyed the sheer unadulterated pleasure of playing this I will outline the salient points briefly. The game covers the famous battle of May 31st 1916 on both a strategic and tactical level. Each side has a plot map of the North Sea onto which the moves of their various task forces and squadrons are written in secret. Searches are carried and when sighting on the map occurs play is transferred to the table top and the ensuing battle fought. After six tactical turns the plat reverts to the strategic plotting stage. Tactical combat is handled very simply with ships from armoured cruiser level upwards represented by single counters and smaller ships by division and flotilla sized counters. Ships have protection factors and a number of gun boxes and firing is handled very simply by rolling a d6, counting the number of firing factors and cross referencing the score against a hit table. Depending on the ship type various target types are not permitted to various firing ships and each generic type of vessel has a range limit. Hits are halved above certain ranges, doubled and tripled when closing. Various additional scenarios and optional rules (including extra counters) appeared in the Avalon Hill General (the in house magazine) and most of these feature as scans on the disc. I would be less than truthful if I said that I was not inspired and filled with misty-eyed nostalgia about this game as I have played this many, many times and it has certainly given me much unexpected food for thought in respect of the Portable Naval Wargame. 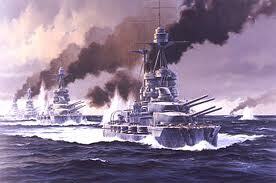 So much so that I am planning to incorporate some of the ideas from Jutland into the revision currently being drafted. One of the rules that really struck me as brilliant concerned torpedo attacks. These are declared at the end of the turn and in the following the target has the option of turning 90 degrees away from the direction of the attack and not firing for the entire turn. The torpedo attack then automatically misses and the destroyers have used up the applicable number of torpedoes.